For a smart dinner party main, serve everybody their own whole trout. Stuffed with herby bulgur wheat and cooked with fresh tomatoes, this impressive yet simple Mediterranean-inspired dish is a brilliant way to try something different with fish. Cook the bulgur wheat to pack instructions. Drain and leave to cool. Preheat the oven to gas 5, 190°C, fan 170°C. Rinse the trout and pat dry with kitchen paper, then season. Stir two-thirds of the spring onions, half the mint and half the parsley into the bulgur wheat and stuff this into the cavity of each fish, then transfer to a baking dish lined with baking paper. Mix the tomatoes and garlic and sprinkle over the fish. Spoon over 3 tbsp olive oil. Cover with a layer of baking paper, then a layer of foil, and bake for 40 mins. Remove the foil and paper, baste the fish with the cooking juices and cook for 10 mins more until the fish is cooked through. Mix the yogurt, remaining mint and the cucumber in a bowl. Season. 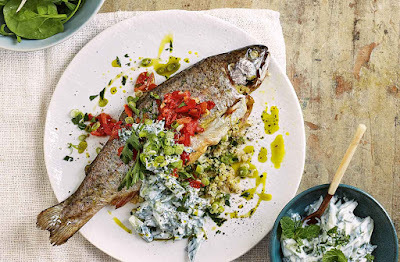 Arrange the trout on a warm serving plate with the remaining parsley and spring onion. Spoon over the cooking juices. Serve with the minty yogurt and drizzle with the remaining oil. Tip: Ask the fishmonger at the fish counter to gut and clean the fish for you.